Christian Dior Dune Pour Homme is designed for strong & purposeful men. Christian Dior Dune Pour Homme 100ml. Eau De Toilette is a floral-musky scent. It represents a scale of contradictory values ​​accompanied by subtle tones of fig, jasmine and currant. At the heart of this impressive cluster of energetic scents you will discover the essence of basil and sage. The base of this bathing water adds to the vibrant tones of cedar and sandalwood. Let yourself whisper in these soothing tones. Christian Dior Dune Pour Homme Men's Eau De Toilette Spray is designed for all men who love life and desire to create their inner values. You will appreciate it not only in the winter months, but even in summer time you will even more vibrate the blood in the veins in the rhythm of the sun's rays. This mellow toilet water is very tough and reassuring at the same time. The Christian Dior Dune Pour Homme fragrance is designed for men who just do not get lost in life. Attentions will not even be attributed to men who like to hear the voices of nature and love the time spent inside. They appreciate themselves and their closest ones. Honor the tradition and its principles. He can create a harmonious home. Order it in our online store and enjoy a wild ride full of unexpected situations. Christian Dior Pour Homme is hidden in an elegant bottle that does not leave any man's cold for just one second. It was launched in 1997 and entered into the life of many men. Christian Dior - perfumery genius, creating unique flavors. 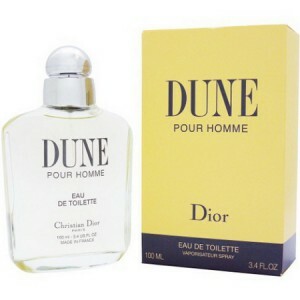 One of his best creations is eau de toilette Dune pour homme. Calming, giving clarity of mind and harmony aroma, reliably hidden from prying eyes in a stylish bottle. The basis of the perfume equation was a lulling sea breeze with a taste of noble varieties of wood. Like a motley ribbon decorated with notes of basil and ripe Sicilian mandarin. A wonderful addition, emphasizing all the advantages of this composition, was jasmine and sage. This fragrance is best suited for men who live at a fast pace. For knights of the XXI century, trying to get along in harmony with nature and yourself. For real gentlemen, always ready to stand up for justice.